Premium grade 18 gauge stainless steel, compact size combination bowl sink, featuring small bowl right hand position, rear drains for more storage below the cabinet, easy care silk rim and bowls, and waste assemblies included. Bowl bottoms are creased and bowl is sloped to center of wasteshole to ensure efficient draining. Two bowl topmount 20 gauge sink, small bowl right hand position. Sink is shipped complete with two stainless steel bottom grids to protect the sink from scratches, and one white plastic colander. Sink features hard wearing satin finished bowls, and silk finished rims, rear drains for more storage below the counter, Spillway<sup></sup> partition between the bowls to prevent water on the counter, and a faucet ledge with 1 hole drilling. 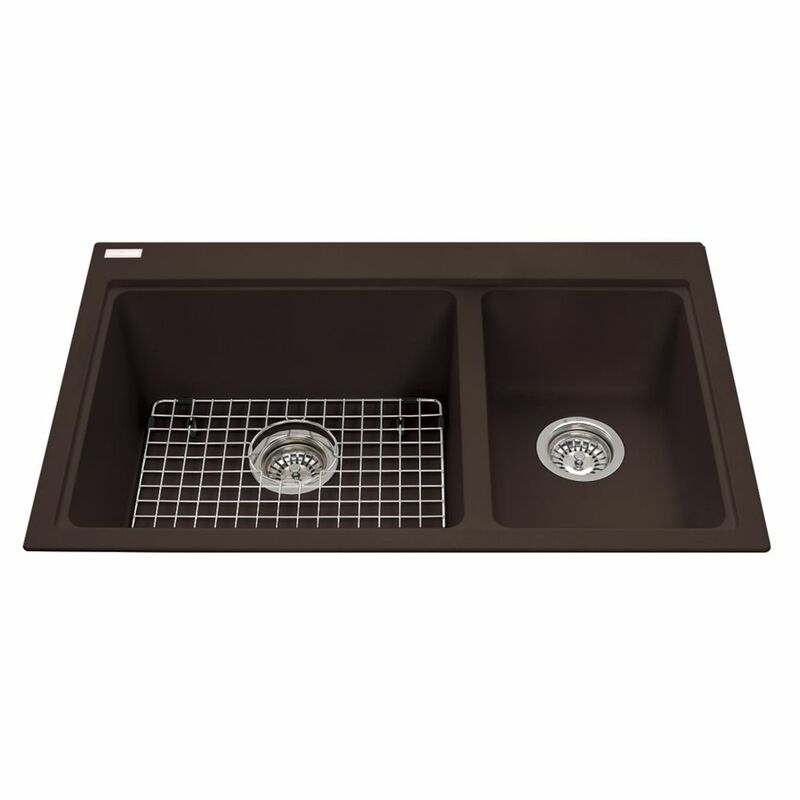 Kindred Combination RH 20 Ga sink 1 hole drilling - 20-9/16" X 27-1/4" X 8"
Combination bowl 20 gauge stainless steel top mount sink. Small bowl, right hand position. Includes faucet ledge with 1 one faucet hole drilling. Rear drains to allow for more storage below, easy care satin finished bowls . Sink is shipped complete with one CA1W colander and waste fittings and is backed with a Limited Lifetime Warranty. Kindred Combination RH UM 18 Ga sink - 20-5/8" X 31-1/2" X 9"
Premium grade 18 gauge stainless steel combination bowl sink, featuring d-shaped main bowl, and small bowl right hand position. Rear drain positions afford more storage below the sink, and silk finish on rim and bowls deliver on bright and shiny good looks, without sacrificing on ease of cleaning. Combination sink Espresso Two bowl granite top mount sink. Includes integrated accessory ledge on sink rim, one stainless steel bottom grid to protect sink bowl, and waste fittings. Kindred Granite sinks feature smooth Durakleen finish to ensure ease of cleaning, and a patented Sanitized Silver<sup></sup> compound for added hygiene even between cleanings.